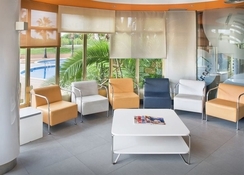 The Hotel Mercury Santa Susanna is located in the picturesque town of Santa Sussana, in the Maresme region. 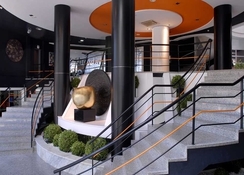 The hotel has a wide variety of facilities and services it offers, which include a leisure area, children's area, a buffet restaurant, a conference room and a 24-hour reception. It also features two swimming pools, saloons with huge flat-screen TVs, a cafeteria, a state of the art gym and a dance floor that hosts live performances. In the locality where the hotel is located, guests can go for biking trips, boating excursions, horse riding and a multitude of water-sports. There are a total of 322 guestrooms that the establishment offers. Boarding options include all-inclusive, half-board or bed & breakfast. 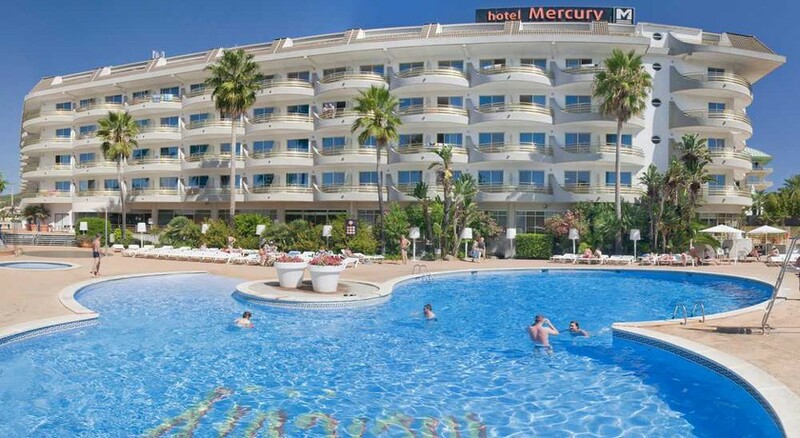 Hotel Mercury Santa Susanna is located just 100 meters from the beach. In its surroundings it is possible to find various places of leisure, as well as bars, restaurants, nightclubs and shops. Directly opposite is the train station. Next to its surroundings, on its charming seafront promenade, day and night markets are held, ideal to visit with children, friends, as a couple or alone. 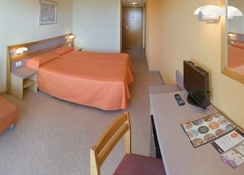 Hotel Mercury Santa Susanna offers 322 guestrooms, two suites and eight junior suites. All rooms come with a balcony, satellite TV, safe, telephone and air conditioning, both hot and cold. There is free Wi-Fi in all of them, as well as toiletries. 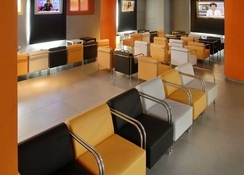 The hotel features a great restaurant that serves up some exciting local cuisine. The on-site bar has some of the choicest spirits and delicious cocktails. The hotel also features a poolside bar that serves cocktails and finger food. There are a few restaurants near the hotel that are worth exploring. Hotel Mercury Santa Susanna has a multitude of services of interest, including Wi-Fi, gym, laundry, currency exchange, swimming pools for children and adults, etc. In terms of entertainment, highlights of the hotel are the in-house animation team that do a splendid job and the ​​recreational machines. Biking enthusiasts will certainly love the resort as there are close to eight mountain indicated routes which are some of the most picturesque in the area! Also, there are three water parks close to the resort. Lovely location, shops located right next to hotel and train station takes you right into Barcelona. Hotel was lovely and clean. The kids loved it and food was nice. Staff very helpful. I was very happy with my stay. Really its very nice hotel and good service. Me and my 8 year old daughter went last year. Was a bit worried as reading previous reviews. We had a lovely time. I hotel was very clean, good location to the beach, shops and public transport. The food was id say average but not bad like seen in previous comments. The pool was a lovely size. We also booked a day out to the local waterpark which we went by coach. Was very easy with regards to pick up and dropping off etc. Was definitely the best part of our holiday. The waterpark was amazing!! The let down for the hotel I would say is some of the staff, they did not seem to want to be there, quite miserable but not rude. Evening entertainment was poor. They would have a theme night mostly every other night which was good where they would have live animals i.e. snakes etc, and then dancers another night. The worst part was mostly every evening they had the locals from other hotels or even members of the public come in (between the age of 50-90) who would come to dance. This would honestly last for hours, the music was all Spanish and everyone was just sitting there watching and waiting hoping something would come on to get us all up, but it didn't! A few of us including other holiday makers asked to play a few English songs as after a week of just Spanish was a bit much. They did play maybe one or two but they seemed to be annoyed and seemed to just wish to cater for the older people who wanted to ballroom dance all night. Me and a few of the other ended up going down to a different hotel just so we could have a bit of "entertainment". I would go again but would defiantly be going else where of an evening. If they was to change the evening entertainment the hotel would be great.